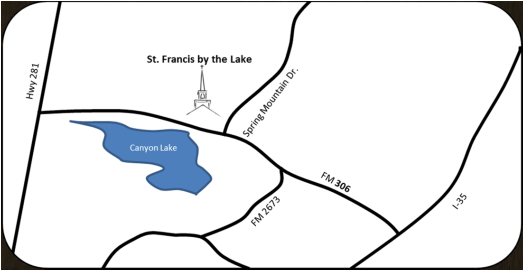 St. Francis by the Lake is located at 13250 FM 306. The cross street is Spring Mountain Dr. and there is a blinking yellow light there. We're about 12 miles from Exit 191, West of I35, just north of New Braunfels, and about 1/2 mile south of Canyon Dam, Canyon Lake, Texas. You can find the location of the church pictured below. For additional detail click on Get Directions. The map opens in a separate window for your convenience. What to expect on a Sunday visit? We want your first visit to be a warm and welcoming experience. One way to do that is to help you feel prepared. As you enter the main doors of St. Francis by the Lake, an usher will hand you a worship bulletin. This contains either the whole service written out (at 10:30), or directions to page numbers in the Book of Common Prayer (red book) and the Hymnal (blue book), and any supplemental materials you might need. If you aren't sure, please don't hesitate to ask a fellow worshiper, or watch and follow others' lead. You can sit anywhere you feel comfortable! There are no assigned seats. If it's crowded, the ushers will help you find a seat. If you arrive once the service has begun, an usher will be happy to assist you to a seat. The early service, without music, generally lasts an hour. The second service, with music, lasts an hour and a half. Worship after both services is followed with hospitality in the narthex (the entryway). Please join us for refreshments and fellowship. Children are welcome at any and all services. Even if they may not understand what's going on during worship, our experience is that they do experience the rhythm and beauty of the liturgy, the people, and the environment or ambiance. We have Sunday School classes available for children ages 6-12. The classes begin during the 10:30 a.m. service after Fr. David has a moment with them to share about the Gospel lesson for the day. The children will rejoin you around the offertory so they may be with you for Holy Communion. Childcare for ages 5 and under is available in the nursery during services. All Christians (baptized with water in the name of the Father, Son, and Holy Spirit) are welcome & invited to receive the sacrament of Holy Communion. To receive the HOST, extend your palms, one on top of the other, facing upward. To receive from the CUP, please assist the minister in guiding it to your lips. If you prefer a Blessing from the priest, please cross your arms over your chest while standing or kneeling at the altar rail. All baptized children (see above) are welcome at the Lord's Table--but we respect parents' discretion. If you, or your child(ren), would like to receive a blessing from the priest at the altar rail, come forward just as you would to receive Holy Communion and cross your arms across your chest, and/or instruct your child(ren) to do the same. St. Francis by the Lake is community, bringing together people of different backgrounds, ages, and interests. Some of our members are only involved on Sunday mornings; others come for programs during the week; and still others choose to help plan innovative programs and direction for St. Francis to grow. Whatever your desired level of involvement, whatever your interests, we invite you to talk to members of our community, to browse the pages of this website, and ultimately to find yourself at home at St. Francis by the Lake. Please know that you are welcome in this community of Christians. To find out more on Sunday, feel free to visit with Fr. David, any of the Vestry members, or any other member of our community. You may also contact the office by phone at (830) 964-3820 or email at francis@gvtc.com. In the Episcopal Church there is no age requirement for baptism. Adults, teens, young children, and newborns are regularly baptized. What is required of us at baptism (according to the Prayer Book) is that we renounce Satan, repent of our sins, and turn to Jesus accept Him as our Lord and Savior. We baptize children and infants so that they can share membership in the Church, be benefactors of God's salvation, and so they may share in the Gifts of the Eucharist. For further information about baptism, call the parish office to make an appointment with the Rector. Confirmation classes (Inquirers Classes) are offered throughout the year. These classes are open to all who wish to be confirmed, received, or who would like to take a "refresher course," or learn more about the Episcopal Church. The time and location of these classes will be announced or you can call the parish office. If you're already a confirmed Episcopalian but would like to transfer your membership to St. Francis by the Lake from another parish, simply consult with the Rector and he will direct you in what needs to be done. We would like to do anything we can to help you become a part of this community - both of St. Francis by the Lake and of the Episcopal Church. If there is anything we can do for you, please do not hesitate to let us know. If you have questions or concerns, please feel free to contact us via the Parish Office, (830) 964-3820. We'll be happy to set aside time to spend with you.